My mother has a long history of making small donations to numerous charitable organizations. She is identified as a known donor and included in dozens, perhaps even hundreds of house and prospect lists. The amount of Nonprofit direct mail advertising my mother receives is unparalleled. Each time I visit her she has stacks of envelopes on her dining room table, sorted by those she is thinking of donating money to and those to which she has already donated money. Being on a fixed income, her donations are small, typically $10 or less, and she prefers to make donations to charities with good reputations. The most amazing aspect of the Nonprofit donor solicitations she receives is the fact that the majority include a free gift. She says, “They’re asking for money, you know.” Yes mother, I know. 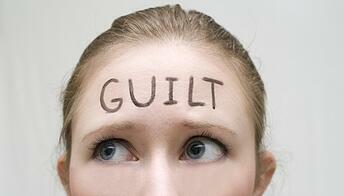 It is the free gift which, if she doesn’t send a donation, she feels guilty for accepting. I keep telling her the organizations sending her free gifts wouldn’t do it if they were not getting a good return on their investment. I remind her that I am in the business myself and I have produced many solicitation mailings for Nonprofits. She doesn’t like to keep the free gifts if she hasn’t made a donation, so she pawns them off on me or one of my siblings or nephews. I have been in the direct marketing industry for a very long time and have seen every conceivable type of solicitation with a free gift, or at least I thought I had. Typical free gifts include: coins affixed to a card or letter, sheets of personalized return address labels, calendars, personalized stationary, sets of greeting cards and envelopes. Larger organizations with bigger budgets may send a bank drafted check for a small amount, parcels containing ad specialty items with corporate logos such as umbrellas, fleece throws, day planners, key chains. What prompted me to write this article is the recently received solicitation pictured below. This one takes the trophy for most aggressive use of the guilt principle I have ever seen. 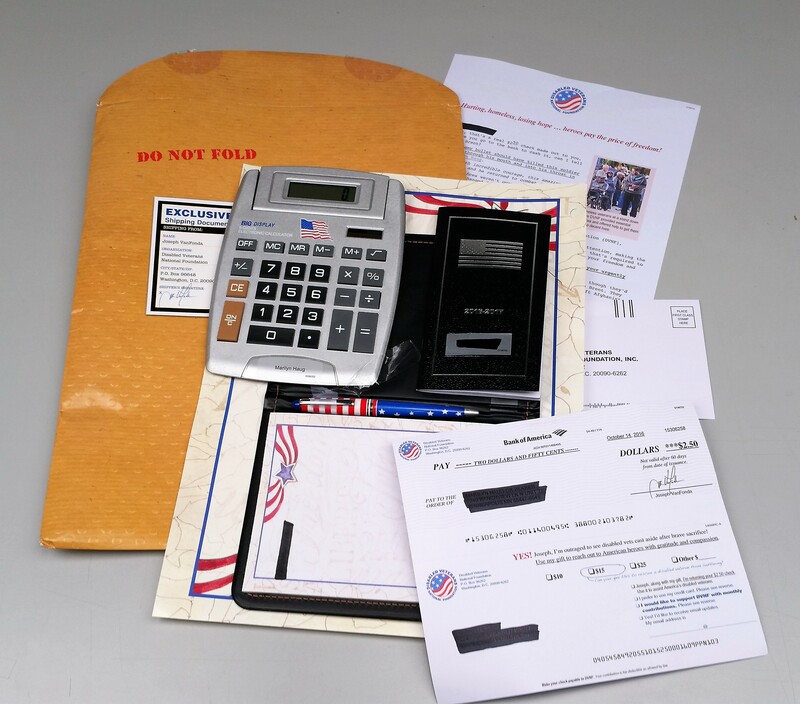 Included inside a massive 12” x 15” envelope is a carrier with a large calculator affixed, a personalized planner, folio with personalized note pad, pen, personalized letter, reply envelope, and a check for $2.50 valid for 60 days with a personalized tear off reply device. A message on the reply suggests returning the $2.50 check as part of a donation. You are not asking for a donation. Always ask for a gift. Studies show word choice matters. People are more likely to give a gift than make a donation. If you are mailing to your own house list and know previous donation amounts you should include the last known amount in your request. Suggest donation amounts at increments starting no more than 20-25% above the most recently received. If you are too aggressive you risk offending the giver. Use the recipient’s name multiple times in your message. Studies have shown people like to hear and read their own name. It promotes the notion that you are speaking directly to that person on a personal level. Give your audience multiple ways to respond. You should include a reply envelope and reply card, a toll free phone number, and a website URL. Consider including a personalized URL (PURL) which leads the prospect to a personalized landing page on a website. Maximum size for letters: ¼” thickness, 6-1/8” height, 11-1/2” length. 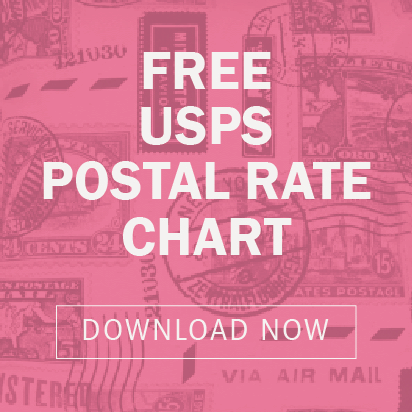 If the dimensions of your mailpiece exceed any one of these measurements your piece will move from letter rates to flat rates and your postage will double. However, oversize envelopes generate the highest response rates of business to consumer direct mail, according to the DMA Response Rate Report 2016, 6.8% combined average for house and prospect lists. A close second is dimensional mail at 6.7% combined average. Making an emotional connection with your audience is always the key to success in any direct mail endeavor. There are many ways to achieve this, and eliciting feelings of guilt have proven to be a powerful driver of response, especially for Nonprofit organizations soliciting donations. The fact that most, if not all of the most recognized charitable brands utilize direct mail and free gifts in their marketing mix is a strong testimony to the effectiveness of using guilt to manipulate consumer response. Mailing ad specialty merchandise can be costly so I encourage you to speak to a direct mail professional about your budget and goals. The advice you receive could make the difference between a low response and a fantastic one.